A lawyer and her partner run from the Colombian Mafia and the corrupt U.S. marshals and attorneys assigned to protect them. Beyonce Flaunts Her Baby Bump in Skintight Velvet Dress, Over-the-Knee Boots and Beehive Choker: Pics! 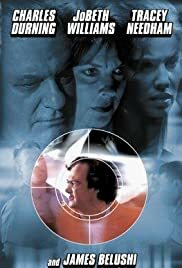 Routine tv movie drama starring some actors who have done bigger and better things but seemed to be in this movie just for the paycheck.The movie "stars" James Belushi,JoBeth Williams,Charles Durning,and Tracey Needham in a plot that is totally unbelievable,filled with poor writing,and bad acting.Belushi,himself,is hardly in the film.It is true Tracey Needham looks great in the film,and one of the reasons for her healthy look is that she was pregnant while doing this movie.It is then hard to believe that a female DA in high heels(Needham) and an elderly heavyset cop(Durning) are working together and staying ahead and outsmarting the drug cartel that wants Needham's character killed.The real name of the film is Backlash.Horrendous is more like it.